Update: This also appears to be true for the new 310.90 WHQL drivers. With the latest (at this time) nvidia WHQL drivers 310.70 and running in SLI mode, Adobe Premiere Pro does not display the video preview when the Mercury Playback Engine is set to GPU Acceleration (CUDA) mode, instead the display is blank, changing to software mode, reverting the driver or turning off SLI mode completely fixes this but it’s not an ideal solution. However I have figured out how to fix the problem and keep the acceleration and driver version. 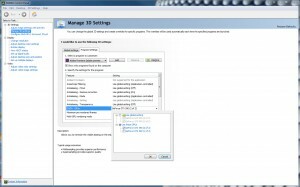 The nvidia control panel in Windows allows you to determine which GPU is used for CUDA for a specific application, by default it is always set to auto, this appears to be why it is failing, as it appears that the GPU it is choosing is either incorrect or Premiere Pro doesn’t support it. At first I tried manually setting GPU 1, but the display was still blank, then I set GPU 2 and it worked as it had in the previous drivers with no further tweaking required. 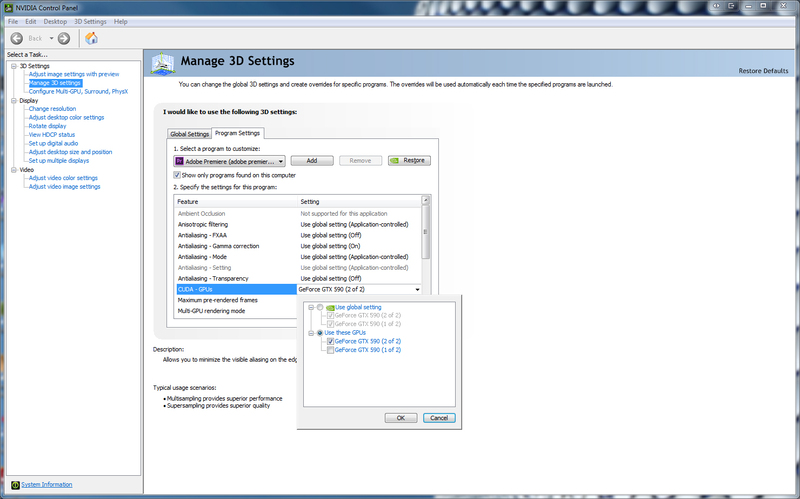 If you have trouble with the setting I have made a screenshot of the setting below.